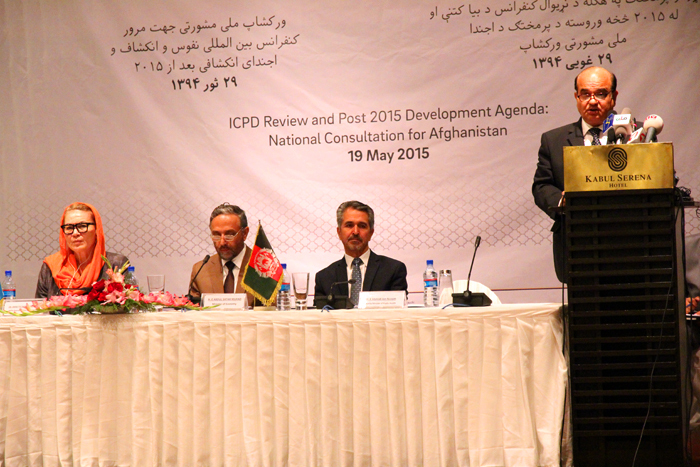 , 19 May 2015 - The Ministry of Economy of the Government of the Islamic Republic of Afghanistan (GoIRA), in partnership with the United Nations Population Fund (UNFPA), convened a national consultative meeting to review recommendations of the 2014 International Conference on Population and Development (ICPD) Review Report in the context of the Post 2015 Development Agenda. High level representatives from different ministries of the Government of the Islamic Republic of Afghanistan, UN organizations, donor community and civil society will participate in the consultation meeting and review key elements of the Programme of Action of the ICPD beyond 2014. During the meeting H. E. Abdul Satar Murad Minister of Economy of the Islamic Republic of Afghanistan said, "Today's meeting was more focused on priorities of the Program of Action (PoA) of ICPD suggested in 1994 in Cairo. The Program of Action was a new beginning in the discussion among the governments on population dynamics, human rights, economic growth and sustainable development. The basis of the PoA is human right protection, investing in health sector, education, gender equality, women empowerment and providing equal opportunities for all. As was suggested by the General Assembly the PoA of ICPD was extended after 2014 and was also suggested that the objectives of ICPD should be included in the Post 2015 Development Agenda and Sustainable Development Goals which succeeds Millennium Development Goals." Last year was the end of a 20 year window for the implementation of the Program of Action for ICPD. The Program of Action was developed as a result of a meeting of 179 countries to advance population and development through a rights-based approach. The UN General Assembly noted that although the PoA of ICPD was coming to its end, but the goals and objectives remained valid beyond 2014 and extended the PoA beyond 2014.The General Assembly stressed the importance of integrating population and development agenda in global processes relating to development including the Sustainable Development Goals. A review of the PoA which took place through global surveys, regional conferences, thematic meetings, briefings, and consultations fed into the discussions of different sessions of the member states in 2014, where Afghanistan was also a member. At these sessions member states also made commitments to Sustainable Development Goals and Post 2015 Development Agenda. "Sustainable development is not just about the economic development. People are at the centre of sustainable development in a world that is just, equitable and inclusive. Gender equality and women's empowerment, health, education and social protection are critical - no one should be left behind and inequities should be addressed" said Dr Annette Sachs Robertson, UNFPA Representative. 3. To develop practical recommendations for incorporating ICPD review findings and relevant outcomes into national policies and plans. The outcome of the workshop was a list of priorities to be used as important inputs in finalizing Afghanistan's position for the Post 2015 Development Agenda and Sustainable Development Goals and a communique agreed upon by all relevant partners in the Afghan Government with input from civil society and development partners.